The Awe-in-one folk series pick is just what I've always wanted in a pick. I started playing guitar 22 years ago, and everything was new to me. For better or worse, I spent 20 years playing everything with a thin pick. No matter how tightly I held the pick, its high amount of flex could take even the hardest strumming I could dish out, but for leads, cross-picking and flat-picking I always had to grab a heavier pick, or boost my volume when plugged in. It was only 2 short years ago that I realized that the trick is to play with a heavy pick, and just vary your attack and grip to change your volume. Tim Perry and Chris Davis - two good friends of mine, and killer guitar players - have been on me constantly. I've tried to make it work but there are two problems. 1) I can't change my bad habits so easily, and 2) I really do like the bright jangly tone I get when I strum with a thin pick. So I play my gigs and I keep a pile of .50 Dunlops and .80 Claytons with me all the time. Not the end of the world - but not so easy and no fun. Now, these Awe-in-one picks have come along and I couldn't be more thrilled! These picks have more than 6 different playing edges! That's 4 more than I ever wanted or thought I needed . I can strum nice and heavy with the .46 edge, and when I go to take a lead I just slide the medium (.60) or medium/heavy (.73) edge around and I can immediately get the volume and fat tone I want. It's almost too easy. Now I can put on the "death grip" or relax into a comfortable lead part, and not worry about strumming too loud or my solos being buried. 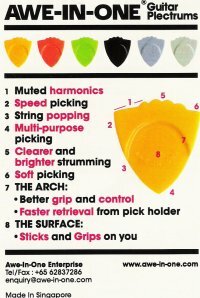 I never used to think about picks at all. Now I almost feel funny speaking so highly of a guitar pick, but these things are really great. Try a sampler pack today and see what I mean.